What are you Planning in 2009? Tired of OUTLINES and TEMPLATES...Wouldn't it be great if you could start with an already researched and written REAL and COMPLETE Strategic Comprehensive Business Plan for your business.....Use the Plan that CPAs, Professors and Consultants use and recommend..with unlimited FREE toll free technical support with techs who work for testimonials and want to help you get the job done! E-Commerce, B to B based upon a full service Internet Service Provider offering systems development, integration and content providing. Includes the History of the Internet and an Internet Glossary of terms and Acronyms. Starting a small business is always risky, and the chance of success is slim. According to the U.S. Small Business Administration, over 50% of small businesses fail in the first year and 95% fail within the first five years. Whether you are starting a business to consumer website or a business to business ISP, ASP, SSP, MSP, NSP... looking to raise additional capital to expand your currently profitable net enterprise, or looking to evaluate and value your net enterprise to take public or sell, current statistics prove that you will do much better with a business plan than without. According to Dunn and Bradstreet the primary reasons for failure vary, but all of the reasons come under the category of poor planning. You are a part of the fastest growing Industry in the world. Your management decisions will decide whether your business survives or thrives in the face of increased competition. The most important benefit of a business plan is that it sets the stage for the future of your business as you want it to be positioned in the marketplace. A business plan will make it easy for your banker to take action as he/she gains insight into the details of your business and the goals that you have outlined. Potential investors can review your plan and decide whether or not to make an investment based upon the risk. You will benefit most as you study and gain detailed insight into your own operations. Updating and constantly reviewing your plan will give you more insight as both a manager and decision maker. TIME IS MONEY...We have estimated that it takes an average of 100 hours to research, and write a comprehensive business plan within any Industry. Creating and compiling the five year financial plan and forecasts including 5 years of budgets, income statements, balance sheets, cash flow analysis, and key financial ratio analysis can take more than 20 hours of work by you or your accountant. Now consider sitting down in front of your computer to edit and fill in the details of an already written and organized internet business plan based upon a full service ISP featuring both software and hardware integration/engineering and content providing. The Industry Analysis includes current trends within the Industry with sources including the Internet society and The Standard. Now use your computer's word processor to turn this sample plan into your own. Enter your revenue assumptions, your operating expense assumptions, your staff payroll and your cash flow assumptions into the QuickPlan® five year forecasting template using your computer's spreadsheet program. You will immediately have five years projected month to month operating budgets, income statements, balance sheets, cash flow analysis and key financial ratios. 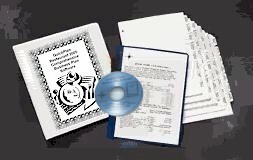 Once you have finished editing, print your plan and simply insert it into the three ring binder included, indexing it according to the pre-labeled inserts. 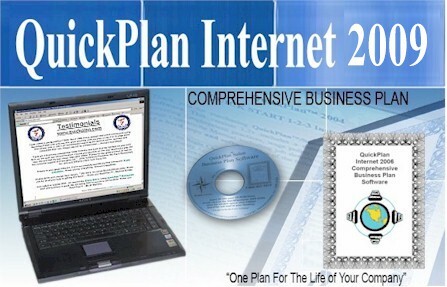 QuickPlan® Internet is a comprehensive business plan based on a full service ISP, ( Internet Service Provider) providing Integration and Content solutions to the Industry. It includes hard copy and software for you to edit into your own. Then simply insert your copy into the three ring binder and organize it with the pre-labeled index included. Business Description including Current Situation, The Business of Internet Business, Inc., Integration and Engineering Division, Content Division, Business Alliances. Industry Analysis Just updated march 2009, Outlook and future 2009/2010. What is the Internet?, Information gathering, Information Dissemination, History of the Internet, The Internet Today, Future of the Internet, Endless Opportunities, Competition, Business Risks including Cost Structure, Technology, Growth, Economy, Government, and Insurable Liability. Glossary of Internet Terms. 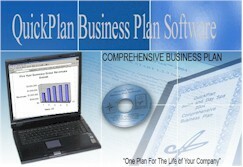 Marketing Strategy including Direct Sales Strategy, Intranets, Alliances, Media, Seminars, and Community/Organizations. Location and Operations, Systems Integrations Services, menu of Services, Office/Location, Network Infrastructure, Expansion, Content Providing and Technical Application Functions. Management covering key officers and responsibilities. Financial Plan summary of provided five year pro forma statements and assumptions, capital requirements, Use of Proceeds, Summary of Projected Financial Statements, Exit/Payback Strategy, and conclusion. Glossary of Internet Terms and Acronyms.